Not long ago, we were given a big chunk of some beautiful Jarlsberg cheese. (Thank you, J!!) We contemplated what we should do with it. And we suddenly realized that it had been eons since we’d had Croque Monsieurs. Unbelievably, I’ve never blogged about this wonder. Even more unbelievably, I hardly wrote about it in my voluminous travel diary (I just looked). And yet I remember clearly the first time we ate croque-monsieurs in Lyon. We rode far away from the downtown core, and happened upon a somewhat non-descript looking bistro. But there were quite a few people there and we were hungry. The blackboard advertised “Croque Monsieur” and “Croque Madame”. Of course we had to stop there and try their sandwiches (not Croque Madame – that includes an egg and the French love to undercook their eggs…). And Oh My. I was in heaven. A Croque Monsieur is the best sandwich in the world. I wanted it to last forever. So, is it any surprise that we wouldn’t want to make Croque Monsieur? And we just happened to have some beautiful smoky village ham from our wonderful Polish butcher. And of course, we had bread. We always have bread. So, after slicing some still beautiful 3 day-old bread based on one of the recipes in Ken Forkish’s excellent book, “Flour Water Salt Yeast”, T pulled out an onion, flour, milk, etc. and started making béchamel. Because Croque Monsieur is always made with béchamel. Isn’t it?? While the Croque Monsieurs were in our toaster oven on the broil setting (no idea what temperature though – the thermostat has always been pretty iffy – the oven temperatures are off, quite warm, hot, and very hot), just out of curiosity, I leafed through the cookbooks on our shelves. Amazingly, our copy of the giant-size, laughably incomplete cookbook, “La Cuisine: The Complete Book of French Cooking”, did have a recipe labelled “croque monsieur” but it looked pretty much like a simple grilled cheese sandwich that had some ham added – no egg, no béchamel. The “Food Lover’s Companion” described a ham and cheese sandwich made with French toast: what I’d consider to be a Monte Cristo sandwich. Unsurprisingly, “The Illustrated Escoffier: Recipes from the French Classic Tradition”, edited by HJ Kracknell and RJ Kaufman, makes zero mention of croque monsieur. In Madeleine Kamman’s “When French Women Cook”, there is no mention of Croque-monsieur or sandwiches; perhaps French women don’t cook croque monsieurs…. Only “Barefoot in Paris: Easy French Food You Can Make at Home” by Ina Garten contained a recipe that looked half-way correct to us. She makes a mornay sauce (she adds grated Gruyère to her béchamel made with “a pinch of nutmeg”) before constructing her croque-monsieur. croque monsieur […] A French-style grilled ham and cheese sandwich that is dipped into beaten egg before being sautéed in butter. One day, my friend Frank friend Frank Newbold and I found ourselves on the way to the Louvre at lunchtime. We passed Café Ruc […] and spotted two seats outside under the awning. They serve traditional French food, but with a modern twist. 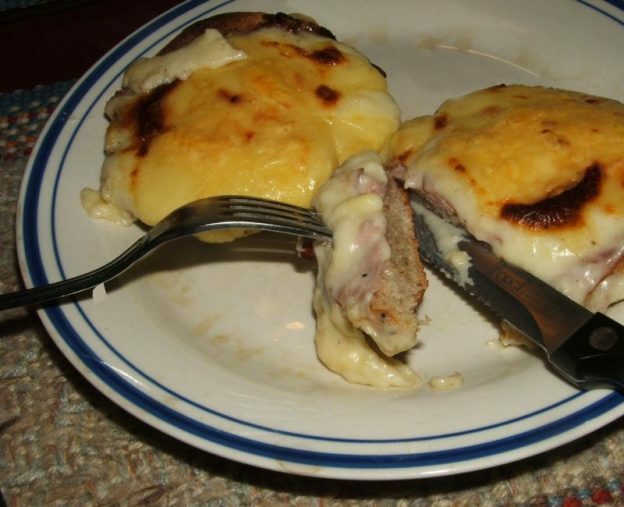 This [recipe] was inspired by the delicious croque monsieurs we ate there. […] lightly brush half the toasted breads with mustard, add a slice of ham to each, and sprinkle with half the remaining Gruyère. Top with another slice of toasted bread. Slather the tops with the cheese sauce, sprinkle with the remaining Gruyère, and bake the sandwiches for 5 minutes. Turn on the broiler and broil for 3 to 5 minutes, or until the topping is bubbly and lightly browned. Nowadays, there are so many different ways to make a Croque. Many people claim they have the “traditional” or “best-tasting” way to enjoy the sandwich, so it’s really a toss up on how you make your sandwich. I believe that with food, everybody looks for something different. An authentic Croque Monsieur has a think layer of cheese, or a broiled béchamel sauce over top (usually composed of Emmental or Gruyère). The ham can be found inside two buttered slices of French bread. Some people like their sandwiches fried in butter, others prefer them baked or grilled. There are several debates about croque-monsieur. The first: béchamel or not? It’s not in the traditional recipe but I think it really improves the taste of croque-monsieur. So béchamel it is, but only inside the sandwich and not on top of it, as I’ve often seen. No béchamel on top?! How silly. It tastes better if it’s on top! And even better if there is a little nutmeg added to it. Of course, our croque monsieurs, with lots and lots of béchamel, tasted best. Did we take photos that time? Of course not!! We were too busy at the table! After that wonderful lunch, we couldn’t stop thinking about Croque Monsieur. A few days ago, I mentioned to T that Kelly (A Messy Kitchen) had made French toast with the last of her Shubbak el-Habayeb. We still had a couple of BBB Shubbak el-Habayeb in the freezer, T wanted to try that. But, for me, unless the French toast is surrounding ham and cheese, to make a Monte Cristo sandwich, it does nothing for me. I said as much…. And suddenly, as a compromise, T announced that we would make open-faced croque monsieurs. Because we can. Who cares about the rules about what bread is used? Shubbak el-Habayeb, halved and toasted, is the perfect bread for croque monsieurs! And open-face is the way to go! Friday, 13 September 1996, 6:15pm […] We just rode for 2 hours straight going about 90 miles through Lyon to get to this hotel. The road we were on [from Monsols] would be gorgeous if it wasn’t filled with rush hour traffic – solid cars going 50 km/hr at least. At least it was downhill. […] [A]t 3:30 after an extremely busy intersection, I got another flat tire – rear again. We switched tires to see if it’s the tire that is at fault. Saturday, 14 September 1996, 4:25pm […] After money changing, we walked along the same boulevard we rode our bicycles yesterday. Today it was jammed with people doing their daily marketing. Vegetables, fruit, cheese, fish, flowers, flowers, flowers. We had coffee at a coffee bar beside one of the florists who was selling tall perfect glads for FF40 a bunch. Another florist had his fedora festooned with flowers and a stuffed birs. His face was craggy and he had an excellent long nose and was stuffing himself with a croissant. Another florist had bouquets lying on their sides facing out ot he street. Sweetheart roses, carnations, daisies, eucalyptus …. At the coffee bar, we had strong coffee. A man ordered a glass of milk with creme de menthe! […] We saw the most perfect mushrooms at one alce. There were several different kinds, all cleaned and nicely shaped. T bought some macaroons that were filled with really good coffee cream. Saturday, 21 September 1996, 4:00pm [We took the train from Avignon to Lyon yesterday] […] We rode out into the neighbourhood, stopping at a cafe for croque-monsieur for lunch. I get the impression that tourists NEVER go there. It was good with draught beer. This entry was posted in BBBabes, bread - yeasted & unyeasted, food & drink on Wednesday, 24 May 2017 by ejm. Those look wonderful! I could easily for for the croque madame as well because I grew up with poached eggs on toast and I love a runny yolk. I think that thought turns your stomach, right? But I LOVE that broiled bechamel on top of yours. Beautiful. I could totally go for that right now. EEeeek!! Runny yolk! Runny yolk!! It makes me a bit carsick…. But yes, you must try this, Kelly. And I can well imagine that if you like runny yolks, Croque Madame would be great.